For the first 17 years of his life, Jose Anthony Gutierrez lived in Vernon, not too far from the now closed Exide Technologies plant. He says he is living proof that Exide is to blame for many of the health issues in surrounding communities. 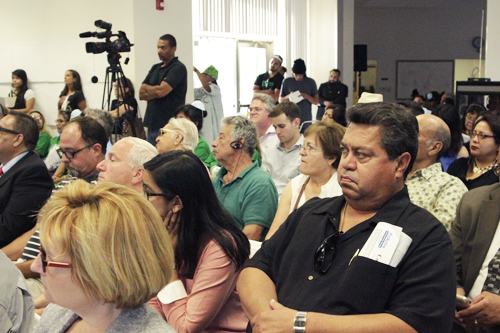 â€œTake a long hard look at me,â€ Gutierrez told state regulars last week during a public meeting of the Department of Toxic Substances Control (DTSC) community advisory group at the Salt Lake Park Community Center in Huntington Park. According to Gutierrez, he and his family lived in Vernon because it was what they could afford. When he nearly died of cancer caused by years of lead exposure, the family decided to move to Huntington Park, one of the cities reeling from the fallout of Exide pollution. â€œThe sad part is Iâ€™m still being exposed to arsenic and god knows what else,â€ he said tearfully. Just over a week ago, DTSC revealed that as many as 10,000 homes could be contaminated with lead spewed by the former acid-lead battery recycler. State regulators said soil sampling was expanded to a larger geographical area and tests showed a much higher number of properties contaminated than previously believed. Angry residents living within the contamination zone â€” from Huntington Park, Bell, Boyle Heights, Commerce, East Los Angeles and other areas near Vernon â€” packed the advisory committee meeting last Thursday and loudly demanded the state agency immediately begin what could turn out to be the biggest environmental cleanup and public health disaster in California history. 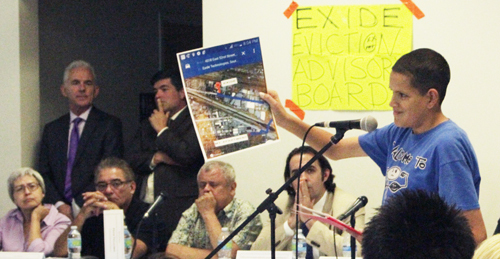 Throughout the meeting, speakers decried DTSCâ€™s years of poor regulation of Exide and voiced distrust of the agencyâ€™s ability to handle the cleanup. â€œNow no one is willing to take responsibility and pay for the harm,â€ said Maria Flores, scolding DTSC officials for allowing Exide to continue to operate on an interim-permit for decades despite numerous toxic emission-related violations. With her elderly father at her side, Flores said he and her husband are very ill. She blames Exide where both men worked for years for her familyâ€™s ailments. â€œMy son was conceived and born while my husband worked there,â€ she said, struggling to hold back tears. â€œHe has severe learning disabilities. He is a seventh grader with a third grade learning capability,â€ she told officials and their advisors. Exposure to lead has been linked to learning disabilities and birth defects. Children are especially at risk because they play in the dirt, according to health and environment experts. Young children who are exposed to lead may also suffer from damage to the brain and nervous system, behavioral problems, anemia, liver and kidney damage, hearing loss, hyperactivity and in extreme cases death, according to the United States Environmental Protection Agency (EPA). Lead poisoning in adults can cause poor muscle coordination, nerve damage, increase in blood pressure, hearing and vision impairment and reproductive problems. According to Flores, the car her father drove to work was found to have high levels of lead. He parked the vehicle across the street or in the parking lot of the facility every day for 27 years, she said. He would load the family into that same car, she said angrily. Participants at the meeting demanded that the cleanup be done immediately. Questions whirled about the cost and who would pay. Decontamination costs for the much larger number of properties is going to skyrocket, according to experts. DTSC Chief of Permitting Rizgar Ghazi said the clean up of the Exide plant alone would cost the company $26 million. Last year, Exide struck a deal with federal authorities and state regulators to permanently close down and set aside $9 million to cleanup 219 homes in exchange for avoiding federal criminal prosecution for its illegal handling of hazardous waste. So far, lead-tainted soil has been removed from 150 homes north and south of the plant. An additional 146 homes have been tested in an area beyond the initial scoping area to determine how far Exideâ€™s contamination reaches. DTSC Director Barbara Lee informed the crowd that the $7 million received from the state last week would be used to â€œswiftlyâ€ clean homes with lead levels above 1,000 parts per million and to conduct additional testing in the expanded zone, which now includes Commerce as well as Boyle Heights, Maywood and Huntington Park. DTSC officials continued to emphasize the agencyâ€™s commitment to cleaning up the community and holding all responsible parties accountable. A capability many in the audience questioned. Boyle Heights resident Yolanda Gonzalez and other speakers urged elected officials and state regulators to push California, Gov. Brown specifically, to declare a state of emergency and for FEMA (Federal Emergency Management Agency) to step in and coordinate a mass evacuation from homes. Families should be relocated and compensated for their homes and their sickness, Gonzalez said. The cost to cleanup one residential property stands at $39,000, according to Ghazi. Lee said DTSC is working to secure funds for the expanded residential cleanup, which could reach hundreds of millions of dollars. Assemblywoman Cristina Garcia represents Commerce and says she does not want any more funds used for testing: â€œWe just need to clean up,â€ she said impatiently. DTSC officials countered that testing is necessary to helps prioritize cleanup of properties with the highest contamination. Lee said the agency and its partners are looking at chemicals that could be the â€œsmoking gunâ€ to directly link the contamination to Exide. Her words seemed to do little to move the hundreds of residents at the meeting to have faith in the agencyâ€™s plan.